A combination of last minute planning and the very poor incentive of a trip to Euston was enough to put off all the regulars from the office, so it was only me and Jack Jones who made the trip round the Circle Line to Euston Square on a sunny Thursday evening. I also had mixed feeling about doing this square as on the pub front there is a heavy concentration of Cask Marque pubs round Euston Station but as previously alluded to, it’s not an area one immediately associates with beauty or sights worth seeing. 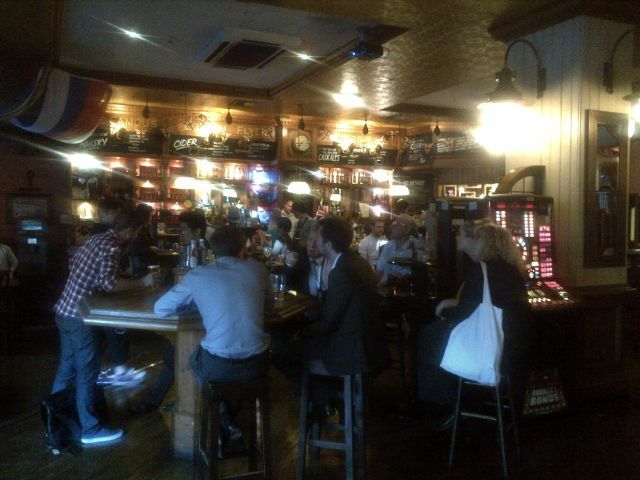 The first pub was The Britannia which is located within the concrete monstrosity that is Euston Station itself. It’s been noticeable that’s there’s been a bit of a resurgence of these station pubs recently with many of them having well needed facelifts and much needed refurbishments. It also seems to be a sector that the big brewing pub groups want to get into to. 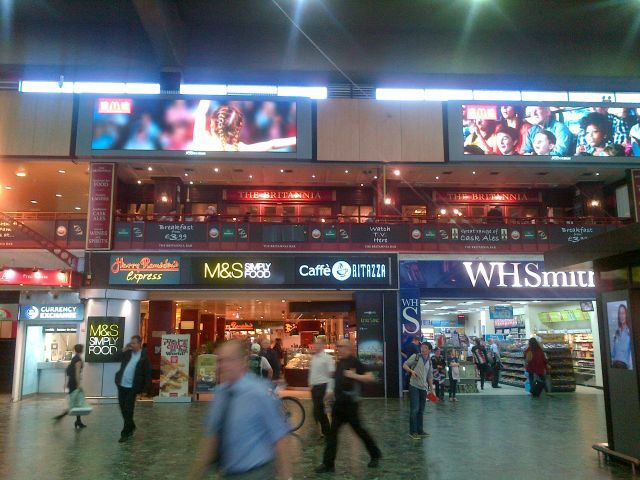 I’d already visited Fuller’s Mad Bishop and Bear at Paddington, The Isambard (also at Paddington) and The Wellesley at Waterloo – the latter two I’m not sure who runs them but going from the signage and styling it seems to be the same company which runs The Britannia. They are a bit of a conundrum these “new” station pubs; on the one hand I have to applaud a better class of boozer for thirsty travellers which have a commitment to Real Ale, and they certainly try to present something more than a swilling hole tacked on to a station. But on the other hand why do they go down the traditional pub styling route? You can’t just sling a few wing back chairs, a mock fireplace and wall lamps into what is a plasterboard box and expect to create an attractive atmosphere. Why try to recreate someone’s local when the one thing you’re definitely not going to have are locals? Anyway before I get too deep, The Britannia was clean and tidy and most importantly had the Cask Marque certificate displayed at the end of the bar. I’d only recently found out via Nate Dawg that it was in fact IPA-Day so it seemed only right to try to drink IPA. The only one on offer was Greene King’s version (which is discussed further in Kings Cross) and the ½ pint I ordered was fine and fresh but it was something approaching relief that I could escape the suitcases and other assorted luggage of the other customers and go and find a proper pub. 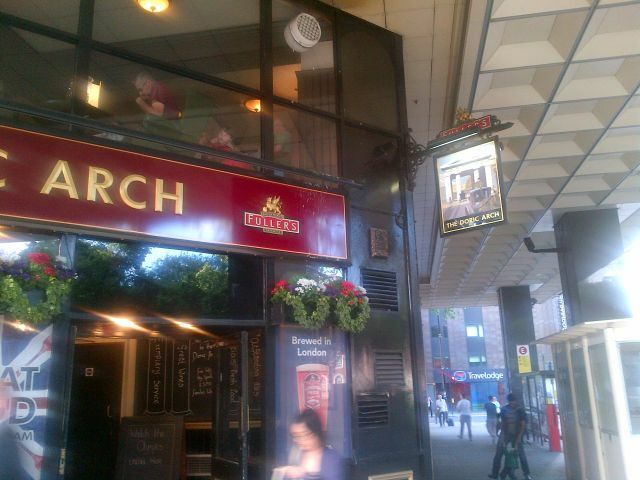 I’ve also previously mentioned in the Kings Cross episode my aborted attempt to find Fuller’s The Doric Arch (Head of Steam) – This time finding it was easier but it’s still tucked away on a corner of Euston Square and although there is a good flow of passing pedestrians, for drinkers searching for the place it can easily be missed. Which is a real shame because it’s a gem! Pleasantly decorated with a railway theme it’s quiet and personable and is probably everything The Britannia wishes it could be. There was a great range of Fuller’s beers on but I blindly plumped for a guest ale, a pint of Mauldons Pickwick which although was extremely well conditioned and very tasty I’d missed the fact they had a seasonal Fuller’s ale on, Wild River, which from the description seems to be very much an IPA to my untrained eye. If you’re wondering about the name of the pub, apparently Euston Station used to have a huge Doric Arch as the entry way to the station. Of course it’s since been pulled down to make way for the modern station but apparently there is a stone of it kept behind the bar. It was then just a short hop over the Eversholt Road to the Royal George, a large traditional corner pub from the Taylor Walker pub group. The barman was more than happy to lift the certificate from where it was displayed behind the bar so I could scan it, and with the pub merrily decked out in Olympic flags it seemed only appropriate to have a pint of Young’s London Gold. 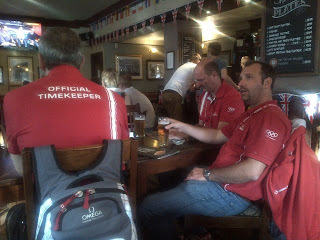 In terms of the Olympics I was in good company as on the next table to me were three official timekeepers from Omega but even their watches would have been put to the test by the amazing antics of the British Cycling Team who were performing world record brilliance on the big screen TV. When the world asks “where were you when Chris Hoy won his 5th Gold Medal?” my answer will be the Royal George, Euston. The official timekeepers measure the awesomeness of the GB cycling team. 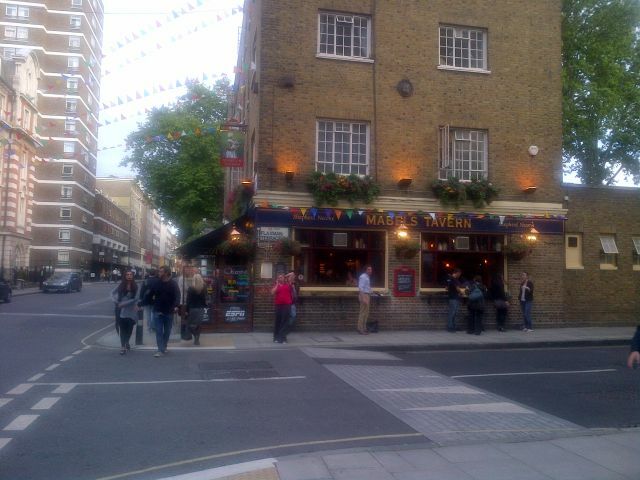 So finally after visiting three pubs I hit the Euston Road proper and crossed it to head up Mabeldon Place to the aptly named Mabel’sTavern. Mabel’s is a Shepherd Neame pub and is a regular entry in CAMRA’s Good Beer Guide (although isn’t in the latest edition – The Doric Arch and Euston Flyer however are) and proudly displays a CAMRA Pub of the Year certificate alongside the Cask Marque one. I asked the barmaid if I could scan it which slightly threw her and she needed to ask permission from the manager to do so (?) - mind you this was the same barmaid who when asking me what I wanted, I indicated that another lady was in front of me, she then went and served the chap behind me! I know queuing is a national sport here but equally interpretation of the queue is a necessary skill that all barstaff should be able to do. Anyway, I digress; I choose a pint of Whitstable Bay and had a nice chat with the lady who had been in front of me in the queue. When the world asks “where were you when Chris Hoy got presented with his 5th Gold Medal?” my answer will be the Mabel’s Tavern, Euston. 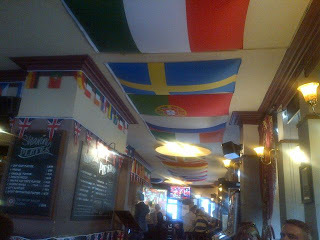 So finally it was on to the 5th pub (yeah, talk about 5 gold medals – what about 5 pubs!) and the only one actually on the Euston Road. 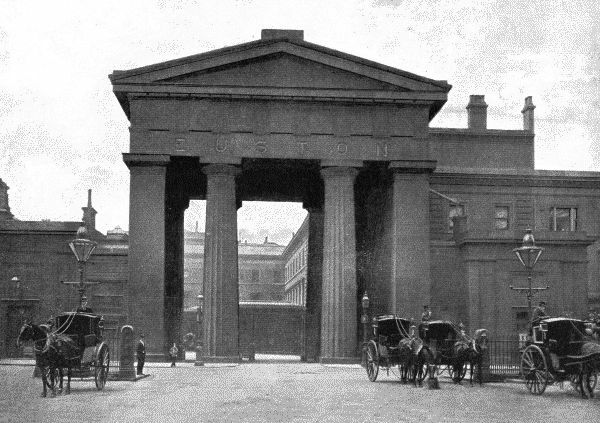 The Euston Flyer is another Fuller’s pub and is a world away from the Doric Arch. It’s a huge place where big screen TV takes priority and there was a large international crowd watching the Olympic swimming. Although the place was rammed with people, service was very quick and my pint of Seafarers was served up almost as quickly as the certificate was given to me from behind the bar, which seeing as the place was so busy was quite understanding by the barstaff. It was only when I was sat down that I saw that the pub actually has two Cask Marque certificates behind the bar, which perhaps reflects the hurly-burly nature of the pub. So with Jack reminding me it was time to go home I made my way back up Euston Road to the tube, it was then I reflected back on my attitude to this area of London. It’s still not the most attractive area but there are some glimpses of magic as well. Just check out the fantastic steeple of St Pancras parish church……………….seriously, check it out. 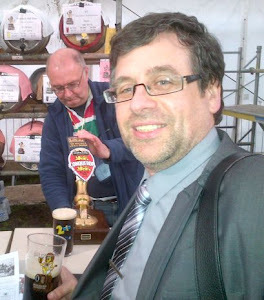 I could also reflect back on a 5 Cask Marque certificate haul which is by far my PB! How did Jack enjoy the visit? = Much better than last time! When’s the next visit then? = Not for two weeks. Unless there’s a Pentonville Road in Malta!